The phrase ‘The 99 Names of God’ is a particularly Islamic phrase and probably doesn’t ring too many bells outside the places where non-Muslims are familiar with Islam. Yet, this is one of the most inclusive Islamic books that I have seen, of course it follows the Quran in that respect. Daniel Thomas Dyer has taken the trouble to root these moving reflections on God (but also tradition and prophethood) in our shared religious heritage. In doing so, offering encouragement and acknowledgement in those few places where Christianity and Islam are irreconcilable, i.e. distinctive beliefs about Jesus. This is rare enough in Islamic books – highlighting the difference between our two creeds and doing so responsibly by using the phrases that Christians themselves would use, without criticism and condemnation – but it goes further than this. Jesus features in this book too, as one of the prophets (and again the author indicates that, for Christians, he is ‘more than a prophet’, as the well-known phrase goes), literally. So yes, Jesus is here, living up to the often marginalised Quranic expectation that not only will Muslims and Christians be encountering and exploring God and our connection to the Divine together but that we will be talking about Jesus with each other. When I attended a Muslim gathering very recently loving Muslim friends were bemoaning the fact that Jesus was much less evident in contemporary Muslim spirituality and reflection, leaving no space and encouragement to talk about him with Christians, only a vacuum that can be filled with the shadow side of mutual encounter – non-recognition, mistrust and suspicion. Of course it doesn’t have to be like this and this book powerfully gives our children, and more mature readers, some pointers on the way. But, Jesus also appears, as does Muhammad, as one of the prophetic illustrations, carefully shown in a way which does not disturb traditional Islamic sensitivities about representations of God’s Messengers. Jesus is depicted with a dove in front of his face. 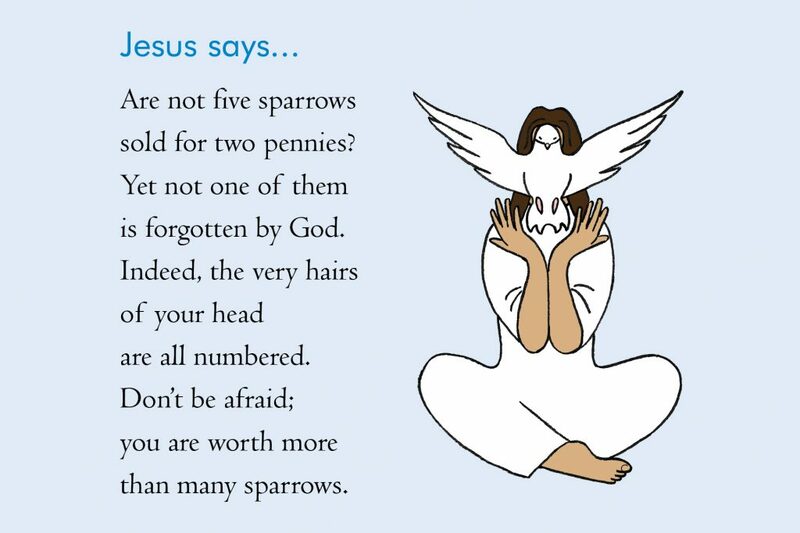 On one page, accompanying the Divine Name al-Muhsi (The Enumerator), Jesus’ words from Luke’s Gospel (chapter 12) are included alongside the illustration of Jesus – ‘Are not five sparrows sold for two pennies? Yet not one of them is forgotten by God.’ This is an extract from one of Jesus’ sermons where he is giving evidence of how deep and secure God’s love is. This key message in the Gospels is at the heart of the Quran and Islamic spirituality too. The 99 Names of God goes further than this on the pages discussing al-Awwal and al-Akhir (the First and the Last, interestingly an expression applied to both God and Jesus in the book of Revelation), by introducing, entirely voluntarily, the Christian belief that Jesus is ‘God made flesh’ (see the beginning of John’s Gospel), alongside the Muslim belief that he was merely a man. This inspires me to think that this is ‘our’ book – one that is for Jews, Christians and Muslims, and for anyone who wants to reflect on the Divine, and in doing so on our own hearts. As well as quoting the words of Jesus, there is also an extract from the Book of Job and three from the Psalms of David. Everything in this book directs us towards the Divine, in the words, thoughts and inspirations of our own diverse traditions. I would certainly recommend The 99 Names of God to all my Christian friends and family, not least because it gives the kind of gentle and loving introduction to Islam that we all need.